Since 1996... We Have Been Listening To And Talking With Dodge Truck Owners About Their Driveability Issues. It Was DT PRO FAB Who Originally Developed A Replacement Tracbar Kit For Dodge Ram 4x4. We Were The First, Certainly Not The Last, Just Maybe... The Best. 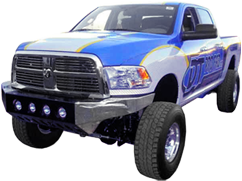 Fitting 1994 - 2011 Dodge Ram 4x4 (Some 1500), 2500 & 3500 Models From Stock Height To 6" & Some Larger Lifts. Quality You Can Count On In Our Products That Have Always Been Proudly Made In The USA And The Value You Can Appreciate In Our Pricing." What Is A DT PRO FAB Driveability Kit? For Those Of You Truck Owners Approaching The Century Mark On Your Odometer You Know Who You Are! Its Time To Tune Things Up. The DT Driveability Kit Includes Our Tracbar Assembly, Link Arms, Steering Box Brace, 4 Bilstein Shocks And Of Course Instructions To Get Your Ride Back On The Road Safe And Sound. All-In-One Price Package To Give You What You Need At An Affordable Price. Got A Lifted Truck, Rides Like A Buckboard What Can Be Done? DT PRO FAB Super-I Long Arm Kit Is A Good Answer. Your Ride Will Benefit From The Engineering And Craftsmanship Of This CAD Designed System. It Enables More Wheel Travel Than Most Shocks Or Springs Can Provide. Lifted Trucks Will Obtain A Smoother Ride By Way Of The Lower Angle Of Attack Than The OE Arms Design. Saw Something On The Blogs About DT PRO FAB Doing Rear Traction Bars? That Is Right. We Have Just Finished Production Of Our Super-I Rear Traction Bars For 1994 - 2004 FORD And 2003 -2011 DODGE Trucks! This System Noticeably Reduces Axle Wrap Not To Mention They Look Awesome! Thinking About Lifting My Truck. What Can DT PRO FAB Do For Me? Plenty! We Offer Lift Kits From The Simple Leveling Kit To 6"+. Higher Lifts Need To Be Mindful Of The Angle Of The Drive Shaft And The Vibration Issues That Can Occur.